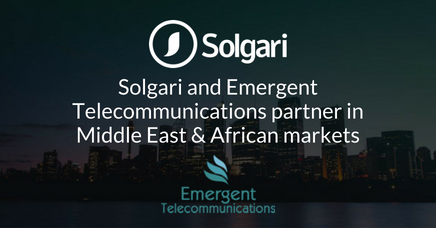 Solgari & Emergent Telecommunications announce partnership in Middle East and Africa (MEA) region to deliver Omni-Channel Cloud Communication software services to the local corporate markets. DUBAI/LONDON – 29th August 2018 –Solgari, the global provider of compliant, integrated omni-channel cloud communications services and Emergent Telecommunications, a leading telecoms and managed service provider across a number of countries in MEA region and Pakistan, today announced their partnership to bring Solgari services to local corporates & SMEs. Solgari provides our customers in 34 countries to date all the digital communication channels – including voice, WebRTC video, chat, IM & SMS – in the cloud, while automatically addressing local and international compliance requirements through a per user per month SaaS model. Solgari partners with leading technology partners world-wide who are focused on delivering transformational cloud solutions to their customers. Emergent Telecommunications, and affiliate telecom service provider companies, are seeing significant business demand for cloud-based communications delivered over the top of their local networks making this a powerful partnership in one of the fastest growing regions for cloud adoption. Countries in MEA region and Pakistan are experiencing a major leap forward to the most modern technologies, such as the deployment of the LTE Advanced 4.5G network. This creates the opportunity to deliver modern communication solutions such as Cloud Business Communications across the top of these networks to fast growing SMEs, local & multi-national corporates who are not encumbered with legacy technologies. Opportunity to consolidate all communications – voice, video, chat & SMS – on a single cloud solution for local and international offices. Achieve instant digital transformation by offering clients all the modern communication channels including completely free options from websites and apps. Compliant recording & archiving of all communication channels as required. Integration between CRM such as Microsoft Dynamics 365, Salesforce.com & Zendesk and Solgari. Secure, compliant handling of any debit and credit card payments using Solgari communication channels. Provide local and international phone numbers as required. At least 50% cost savings with a per user per month SaaS model vs the alternative of using multiple vendors. Solgari’s services are available for a 2 weeks free trial at https://www.solgari.com/trial-solgari/ or please contact sales@solgari.com for more information or a demo. Emergent Telecommunications is a Managed Services Provider for Information and Communications Technologies. As a group company of a HB International, a conglomerate, Emergent Telecommunications brings over 20 years of proven professional experience in the fields of Telecommunications and IT infrastructure. In the realm of technology disruption, which is drawing new boundaries the way business is conducted or information is processed, Emergent Telecommunications has taken an early step to be an important link in the new value chain. With technology ventures in the field of Telecom/Media/Computing/AI & BI/ IOT, Emergent is engaged in techno-commercial modelling to the benefits of product developers and end users, alike. 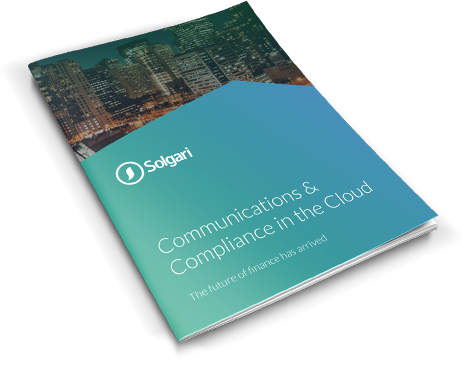 Solgari provides Compliant & Integrated Omni-Channel Cloud Communication Services to FinTech, Financial Services, eCommerce, Retail, Logistics, Recruitment & Government customers in 34 countries to date. Solgari’s integrated cloud software service provides all the digital business communication channels – voice, video, chat, IM & SMS – while also including GDPR, PCI DSS & MiFID II compliant recording & archiving of all communications. Customers can access all business communications & related compliance requirements regardless of location on a per user per month SaaS model while removing or avoiding the cost & complexity of legacy technology solutions. Your guide to complying with GDPR, MiFID II & PCI DSS across all communications. Solgari provides Compliant & Integrated Omni-Channel Cloud Communication Services to FinTech, Financial Services, eCommerce, Retail, Logistics, Recruitment & Government customers in 40 countries to date. Solgari’s integrated cloud software service provides all the digital business communication channels – voice, video, chat & SMS – while automatically addressing GDPR, PCI DSS & MiFID II regulations through compliant recording & archiving of all communications. Customers can access all business communications & related compliance requirements regardless of location on a per user per month SaaS model while avoiding the cost & complexity of legacy technology solutions. Let’s discover how we can significantly strengthen your communications, streamline your operations and cut your costs.